We are an android family. By that I mean Wendy and I with our kids all have phones that run on an android platform. As part of that functionality we are able to use Google Hangout, which we love! It allows us to chat, send notes, embed photos and well, stay in touch. We have several chats going and if you know GH you know what I mean. 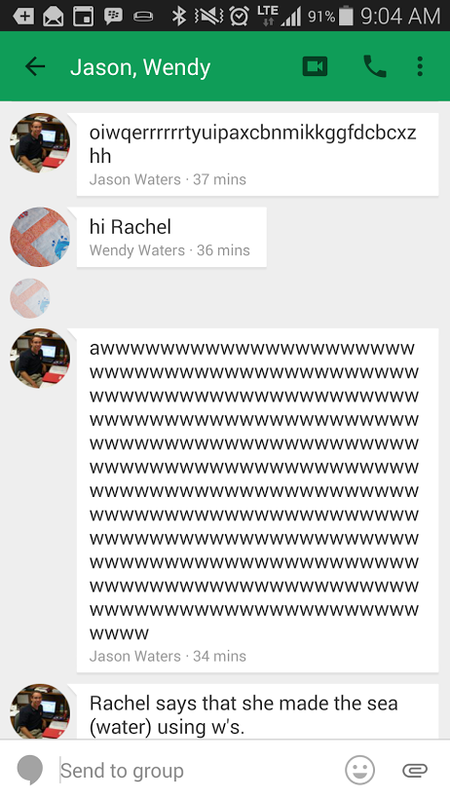 This morning the open chat with Wendy, Jason and I sprung to life. At first it seemed someone might have dropped a book on the keyboard but then…well, look below and you’ll get where I am going! It was our 3 year old granddaughter – she can’t spell yet but it’s clear it won’t be long and we’ll be adding her notes to our communication. Not that we want her on the computer too young – but yes I can hardly wait to get a note from her! Did I mention how much we love being grandparents!